The Grausamland - a gray mire of marsh, bogs, sluggish creeks, and deep pools - stands as a barrier to those who would enter the giant fortress of Aufstrag. A thousand square miles of impenetrable swamp lands peopled by monsters great and small; with fang and claw, upon dusky wings, or slithering through the filth they hunt any who dare to enter the Gray Pools. So great the danger that the Lords of Aufstrag ordered a road constructed; it stretched for 3 score miles over the swamps before it came to the Withing Uplands. So great was the menace that the Lords of Aufstrag long ago built a causeway, 75 miles in length, spanning the northern acres of the Pools and giving travelers some shelter from the dangers of the journey. It crossed from the Portico of Aufstrag to the Withing Uplands. Where the causeway met the plains, the soldiers of Aufstrag costructed a gatehouse. Two mighty bastions flanked the iron gate, so that any who passed must contend with the garrison within. The causeway wound its way across the marshland, held above the water and muck upon mighty pylons of stone that were shaped like the gods of dwarves- slaves, to Unklar�۪s mind. Way stations were set up every 20 miles, offering travelers a place to stay, safely out of reach from the creatures that hunted in the swamps. Nothing could wholly protect those supplicants of the horned god from the terrors of the Pools. Such were the losses that travelers suffered in the trek over the swamp; that men took to calling the causeway "The Wasting Way". All that has fallen to the hand of time and war; now the Wasting Way stands abandoned and in ruins, and travel upon it an even greater nightmare. Whether the journey carries you across the swamp upon the long abandoned causeway, or the Lady of Garun calls upon you to free her tormented soul from the grasp of the evil devil-lord Coburg the Undying, travel upon the Wasting Way is a journey fraught with peril and one only the stout of heart dare. But the unplundered wealth of a thousand years waits on the other side. Conquer the Wasting Way and come at last to the door step of Aufstrag! 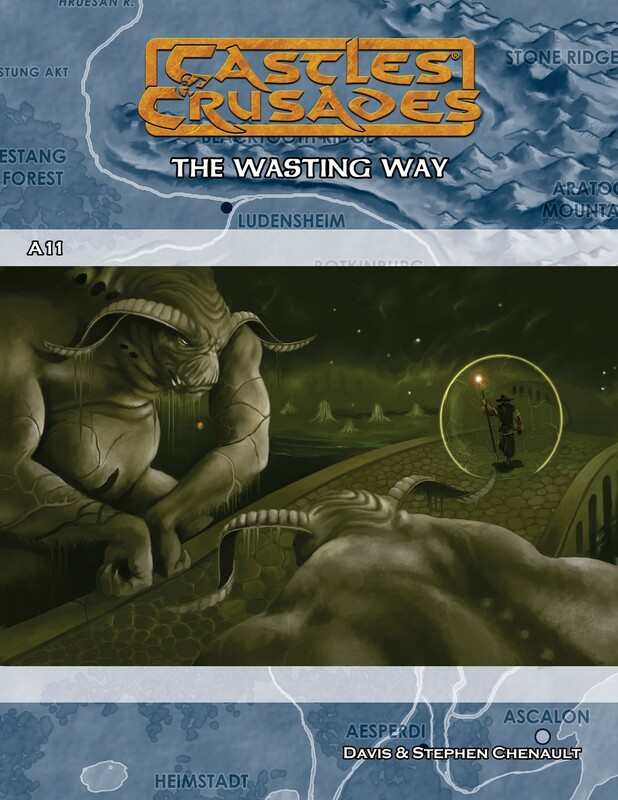 The Wasting Way is an adventure designed for 3-5 characters of 11th-13th level. It is designed for modular play or as an area to explore. Play with your homebrew game or in the world of Aihrde.